Denver Broncos wide receiver, Demaryius Thomas, says he’s not worried about the matchup with Seattle Seahawks cornerback, Richard Sherman, on Super Bowl Sunday at MetLife Stadium. In fact Thomas told the media aboard the Cornucopia Majesty ship in Jersey City that Sherman has a weakness in his game. 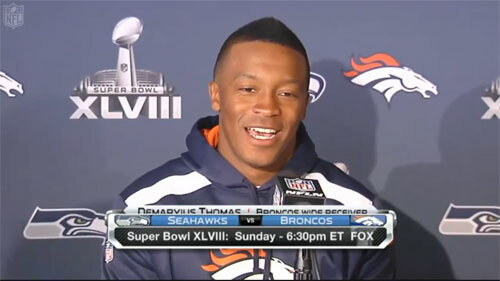 Photo shows Denver Broncos wide receiver, Demaryius Thomas, speaking to the media on Monday, January 27, 2014, about the Super Bowl matchup with Seahawks cornerback, Richard Sherman. Thomas considers Sherman a friend and has respect for the outspoken cornerback calling Sherman “one of the best in the league.” When asked what the weakness was Thomas said, “You’ll have to see come Sunday.” Obviously, Thomas is not going to reveal any surprises he may have to exploit Sherman’s weaknesses. Watch the video below where Broncos wide receiver Demaryius Thomas talks about matching up against Seattle Seahawks cornerback Richard Sherman and how teammate Wes Welker has helped him improve. Thomas was selected by the Denver Broncos with the 22nd overall selection in the 2010 NFL Draft. In 2013, Thomas received AFC Offensive Player of the Week honours for the first time in his career in the Broncos’ Week 10 win over the San Diego Chargers. He posted 7 receptions, 108 yards and 3 touchdowns. Demaryius was again voted to the Pro Bowl. He was selected to the Associated Press All-Pro team for the first time in his career. Sports Speakers 360 is a booking agent for motivational sports speakers. If you would like to book athletes like Demaryius Thomas for a speaking engagement, autograph signing, guest appearance, product endorsement, fundraiser or corporate event, contact our booking agent for appearance and speaker fees or call 1.855.303.5450.